Stuffed peppers have never been my first choice for dinner- but juicy ground turkey, cheese and a dollop of sour cream and I’m GAME!! 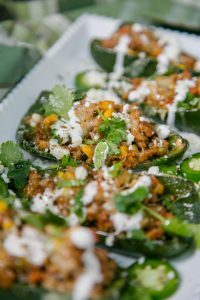 I used poblano peppers for these but you could also use bell peppers if that’s what you have on hand! I like to roast the peppers for a bit to get them just soft enough without falling a part completely. The second time I made this recipe, I skipped the peppers and I turned it into a southwest pizza by placing the turkey on a pre-made flatbread crust, baking it with some cheese on top and then I topped it off with my famous cilantro jalapeno sauce!! It was soooo goood! The ground turkey in this recipe is GREAT for meal prep and you can make a big batch ahead of time and it’s low carb/keto friendly! I hope you guys enjoy this recipe!! You can substitute chicken for the ground turkey. 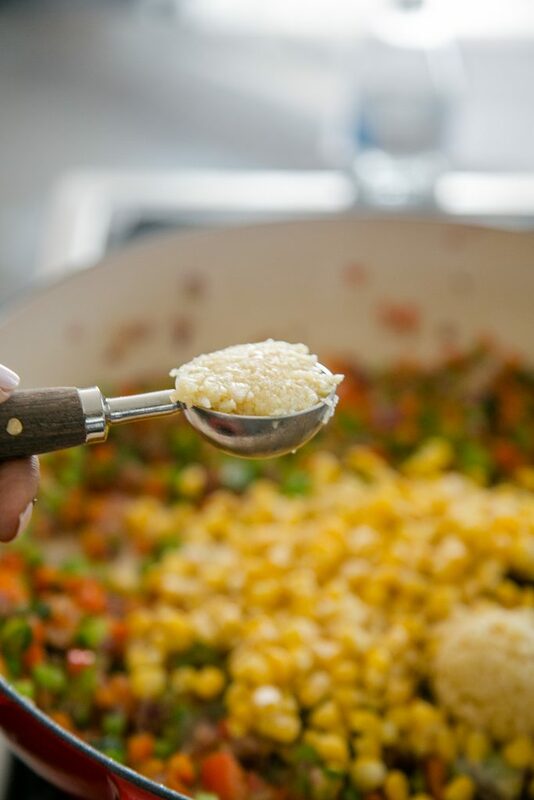 You can add in black beans, and quinoa to make this heartier ( and leave out the turkey to make this vegetarian). Make southwest bowls by throwing in toppings of your choice like lettuce, salsa, guac etc! 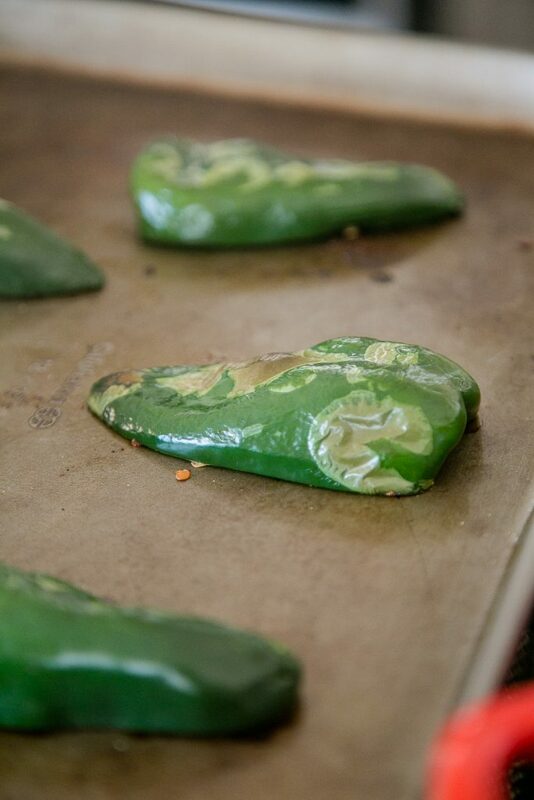 Slice the poblano peppers lengthwise and place cut side down on a baking sheet. Place in oven on lo broil for about 3-5 minutes or just until the peppers have started to get a few brown spots on them. You want them to hold their shape but be slightly softened. In a large skillet or pot heat the oil. Once oil is hot, add the serrano chilis and let splutter. Add the diced onion, pinch of salt and cook until onions are almost translucent. 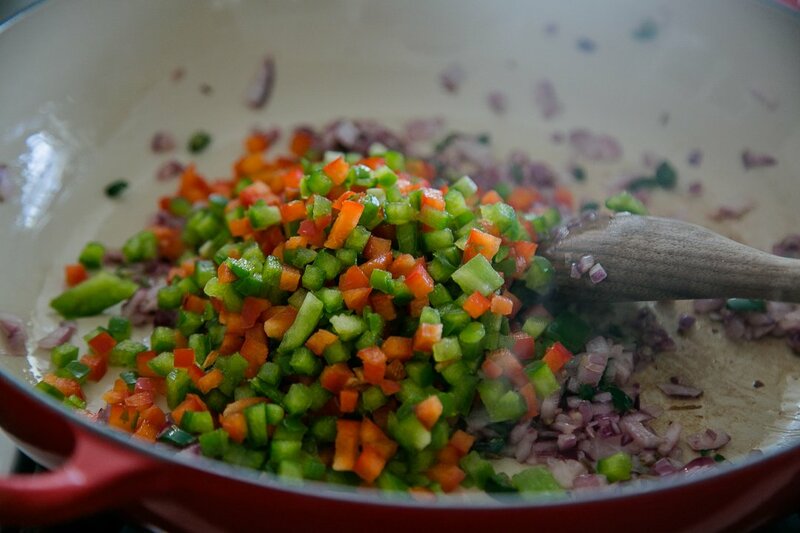 Add the red and green bell peppers and continue to cook for 3-4 minutes until they have softened. 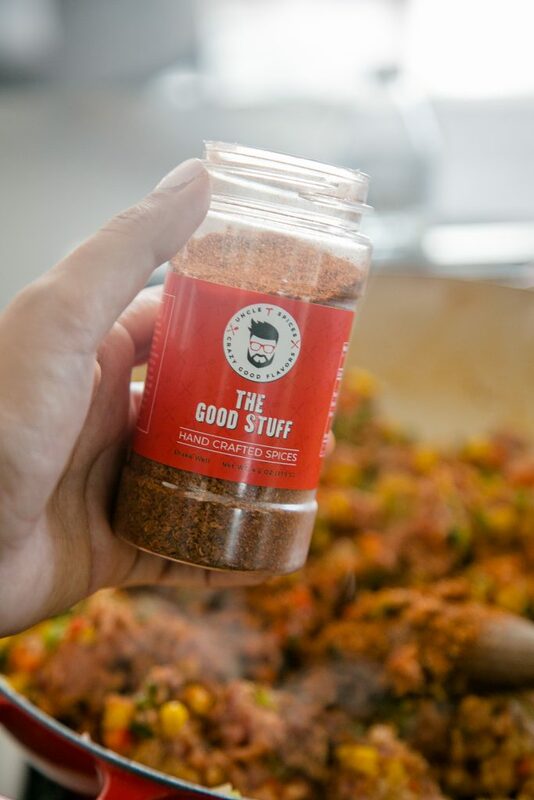 Add garlic, cumin, coriander, chili and good stuff seasoning and stir well. 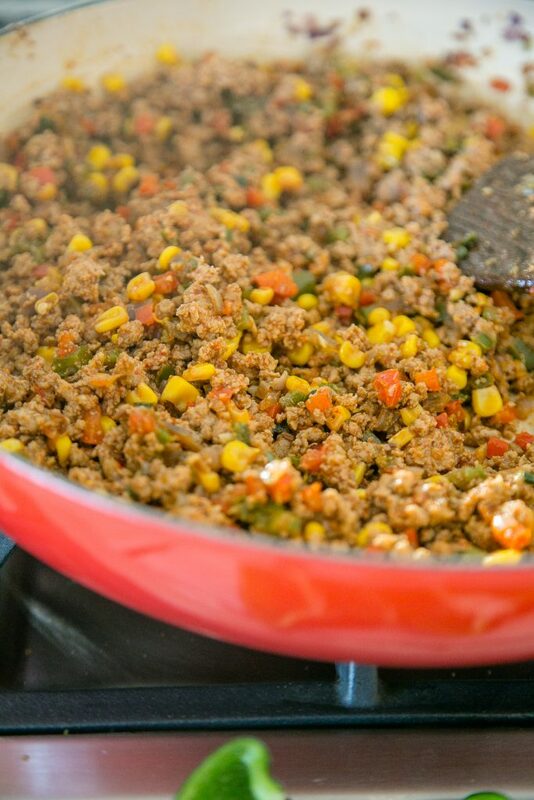 Cook this mixture for about 2-3 minutes and then add the ground turkey. Use a wooden spatula to break up the turkey so it is in tiny crumbly pieces and the spices are incorporated with the meat. Continue to cook for about 8-10 minutes. Turkey is cooked when there is no longer pink and all of the meat has browned. Add in the corn, cilantro and stir well. Remove from heat. Spoon the turkey mixture into the poblano peppers and top with cheese. 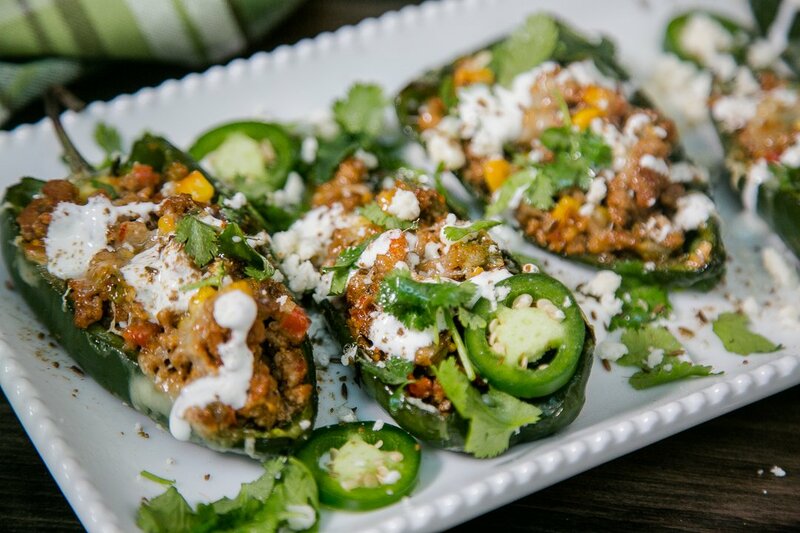 Set in oven to low broil to melt the cheese and serve hot with a drizzle of Jalapeno Cilantro Sauce or sour cream !